Here’s a page to print out and keep in your Survival Mom reference binder. Which types of plastic containers are safe for food storage and which aren’t? It’s a common question, and rather than answer individual questions, I tracked down a summary of information that will help you determine which types of containers to use for storage purposes and which to avoid. From The Virtual Weber Bullet, here are the basics. You can read more at their site and Care2. Another important type of plastic is polycarbonate, a clear shatter-resistant material used in restaurant food storage containers and the Rubbermaid Premier line of stain-resistant home food storage containers. Baby bottles and most 5-gallon water containers are made from polycarbonate. Are you a food storage snob? "In summary, categories 1, 2, 4, 5, and 7 are considered to be food safe." This is NOT true. There are HDPE (2) white buckets that are manufactured as food safe, and there are those made with a cheaper process for utility use. The following note comes from the page referenced above: "There is a common misconception that all containers made of white plastic or HDPE plastic bearing the HDPE "2" plastic symbol symbol are food grade containers. This is not true." I have made this mistake myself and packed twenty buckets obtained cheaply at Lowe's, which I must now replace. Another option which I have started using as my stores increase is mylar bags with oxygen absorbers in food grade 55 gallon drums. These barrels with removable tops, which usually contained orange or apple juice, or other food ingredients (as indicated by the sticker on the outside), can be bought for $8-10 and go a lot further than buckets. The only negative I have found are difficulty in moving them around, as they will weigh 300-450 pounds when filled. However, that would make it more difficult for a hit and run thief to carry off all of your food stores, and there is NO chance that a rat could chew through the steel. Steven, thanks for the reminder about the category 2 plastic. What I had in mind was using it in conjunction with mylar bags, but you're right. On its own, it isn't food safe. Thanks! I made the correction and am going to put this information in a download available at the resources tab at the top of my blog. You could put multiple things in each barrel. It would indeed make it harder for a 'hit and run'. If they're metal I wonder how good a Faraday cage they make? Lol. I've been working on my physics homework too long, I think. it is a good idea though, and you're right it would deter rodents and, in my case, pets. 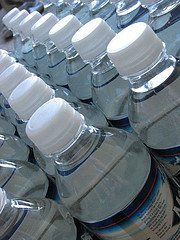 #7 plastic – polycarbonate – contains BPA which can leach into your food and causes problems (that's why they've changed up baby bottles – BPA has been banned from most children's products in Canada because it's toxic.) Our own governmental agencies (NIH, EPA) have linked it to cancer, early puberty in girls, adverse neurological effects, and it's a known endocrine disrupter. So I wouldn't consider #7 to be food safe. #2 HDPE buckets, that originally contained food products, like those I get from my bakery that contained fillings, etc., are food safe. So are the #2 HDPE Tropicana OJ containers that I wash, disinfect, and use for long term water storage. Please check with the LDS experts and you'll see that this is true. I really enjoy your blog but I think you missed the mark on this one. The 2 liter soda and 64 out juice bottles (PETE #!) have become my faves. I've stored everything from water to beans, rice, salt, sugar, and even cornmeal and stuffing mix. Toss in an O2 (or just desiccant for sugar) and you're good to go! I have them stacked on their sides with the ingredients labeled on the lids and instructions on the side. One of our first storage adventures was buying 4 of the orange 5 gallon buckets, and lids, (HDPE #2) from Home Depot. We put 50 lbs. of (each) pinto beans and white rice inside 5 gallon Mylar bags, sealed them w/ 2000 cc O2 packs in side the buckets. They're just sitting at the bottom of MomMart and are our long term insurance. Feels good! THANKS FOR THE COMMETS ON SAFE PLASTICS. IT CAME JUST IN TIME AS I WAS PREPERING ITEMS FOR STORAGE.I WAS ABLE TO FIND 30 GAL CONTAINERS FOR MY DRY GOODS INCLUDING M R E'S. THEY ARE A LITTLE EASIER TO MOVE. Where did you get the 30 gal containers? Locally or on the Internet? is ABS grade plastic used as a storage tank in modern water purifiers is good for health or not?